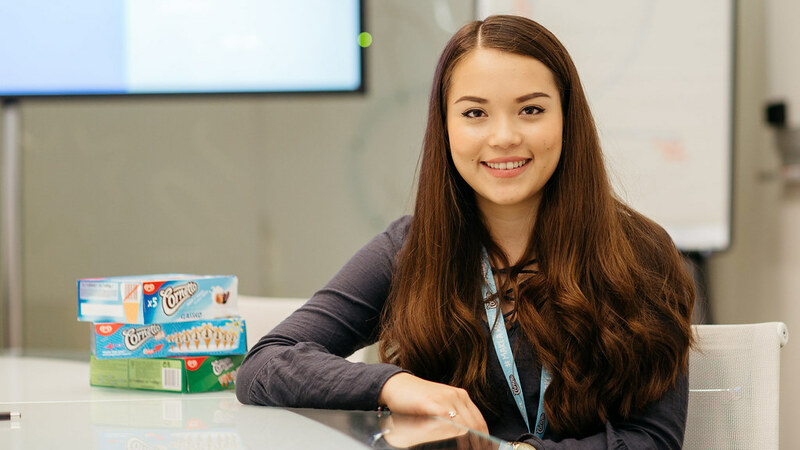 BSc Management with Marketing student Alexandra Christandl on building relationships during her professional placement with Unilever. School of Management students do placements at hundreds of companies. Many of them work exclusively with us. My role was Assistant Digital Marketing Manager for Cornetto Ice Cream. I worked to produce assets for the brand that were used on social channels. This involved working with creative agencies and local markets. From the start, I showed motivation and passion, so I was given autonomy. I was constantly empowered to lead projects and take credit for the work I accomplished. Unilever is an extremely forward-thinking company and all staff at all levels are working to create a brighter future. My placement year showed me the endless amount of opportunities there are out there for me. It exposed me to a variety of professionals, helping me to build contacts for the future. My placement showed me how bright my future can be if I recognise opportunities, capitalise on them and work hard towards achieving anything I want to do. It was close to perfect in terms of working in an industry and on a brand that I feel extremely passionate about. I was constantly supported and recognised for my accomplishments. In only one year I feel I have made my mark within my team and have built professional and personal relationships for the future. The School of Management’s Placement Team helped me recognise Unilever as a potential company to work. They then helped during the application process and were throughout the year when needed.